Proper storage can keep birdseed fresh and nutritious for longer, ensuring that backyard birds have the very best to eat. Whether you need to store birdseed from a great sale, to stock up for winter or just find it convenient to have plenty of seed on hand, it must be stored well to make the most of every seed so none is lost or wasted. Birdseed must be stored carefully or it can be subject to a wide variety of problems. Mice, rats, raccoons or other animals can gorge themselves on seed that is easily accessible, while insects and other pests may infest the seed and make it unfit for birds to eat. If seed gets damp, it will clump, fester and mold, which can make birds sick. Old seed loses nutritional value and is not as healthy for birds, and if seed is in very poor condition, birds may not eat it at all and will simply move on to other food sources, abandoning a backyard feeding station. By properly storing seed, however, these problems can be avoided and birds will always have safe, nutritious treats to enjoy. Birdseed containers should be durable, made of galvanized metal or thick plastic with rounded corners to resist chewing by persistent rodents. While airtight seals are not necessary, the covers should be firm enough to keep pests away from the seed and to keep water out of the storage container. The covers should also fit tightly enough that they cannot be worked loose by industrious pests or blown off by a storm. The size of the storage container should suit the amount of seed you have to store, so no seed is left unprotected. Very large, bulk bags of seed will require larger containers, while smaller, more expensive or less frequently used seed may fit into smaller bins or thick plastic bags. At the same time, consider how heavy the full container will be, and be sure it can still be lifted or moved if necessary, even when filled. Several smaller containers can also be used in place of one large one. Containers should be kept in a dry, cool, safe location such as inside a garage or garden shed, which can provide another layer of protection from pests and poor weather. Positioning heavier containers close to feeding stations will make it easier to refill feeders, and they should be easy to access in all types of weather. Avoid placing containers where pets may bother them, or where they will be in the way of other outdoor activities such as blocking garden tools or obstructing a path. Once seed is properly stored, it is important to inspect it regularly to be sure the containers are doing their job. Sift through seed to check for signs of moisture, insects or mold, and check around the container as well for evidence of raiding pests. Rotate seed so the oldest supply is used first, and thoroughly wash and disinfect the containers at least once or twice a year to keep them safe for storing seed. 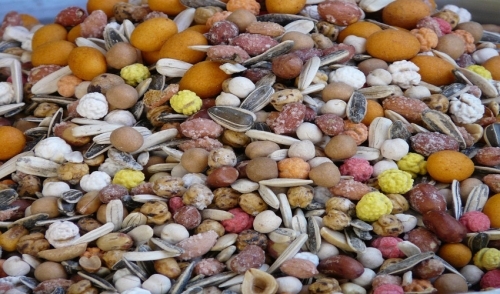 Storing seed well is more than just keeping it in a convenient location – it also keeps seed fresh and nutritious for months, allowing birders to easily stock up and never worry about their backyard birds missing a meal.